Portrait painting has never been a skill that about which I feel very confident, so today I spent some time practicing the painting of noses. It was fun. I didn't worry about getting all the features correct, but simply concentrated on noses. This one is my favorite. It is 4x6 inches on a canvas panel. With any painting, one gets better with practice. Now I need to try some mouths and eyes. Eventually I might be able to put them all together. A visit to our local produce market resulted in the purchase of some beautiful pears. There were three, but I ate one. It was sweet and crunchy. 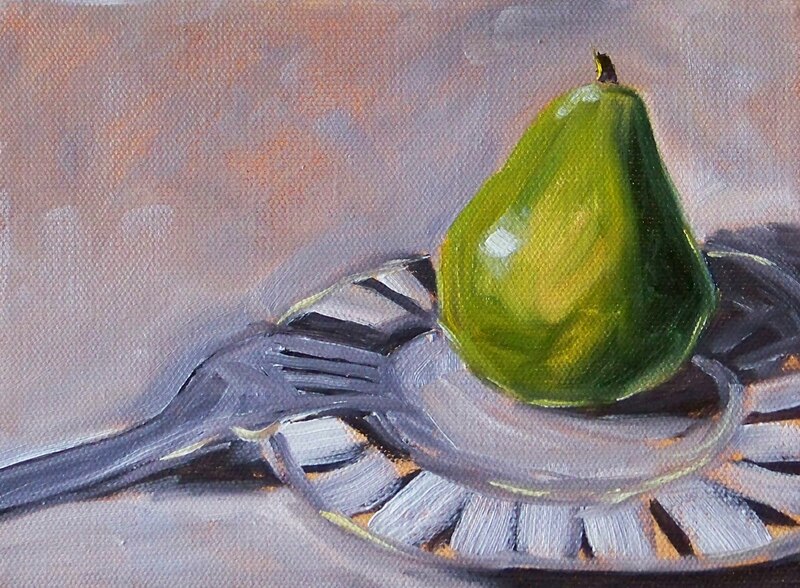 My next painting may only be a single pear. 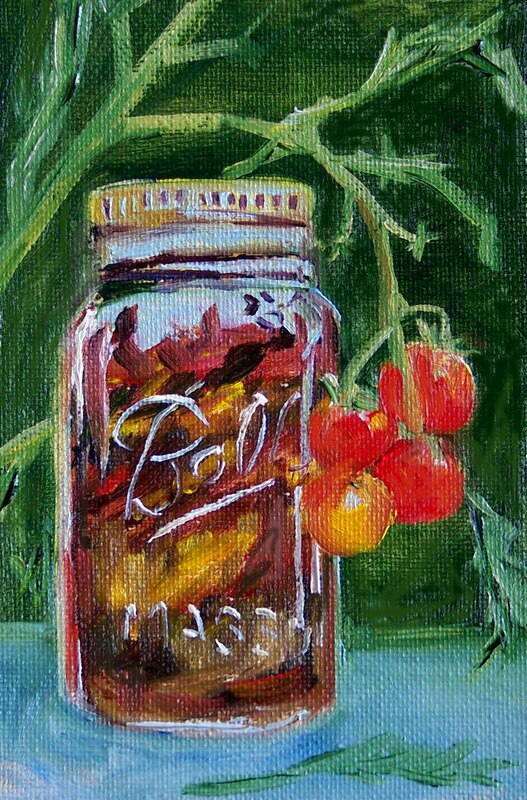 This little painting is 4x6 inches. It will join some of my other small still life paintings of fruits and vegetables that are for sale at my Etsy Gallery when it dries. This afternoon I will probably create a companion piece. Yesterday morning I rose early and took a trip to the dog park at Fort Steilacoom Park in Lakewood, Washington. It is the largest dog park I know of in Pierce County, 22 acres just for the dogs. I left early to watch the sun rise and get some photos of early morning shadows. This quick sketch is the result of my adventure. 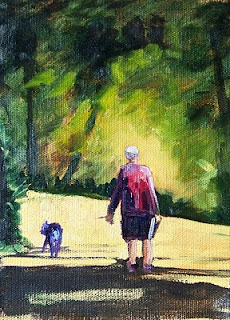 Painting people with their dogs is a subject that is just plain fun. There are so many shapes and sizes of people and pets. 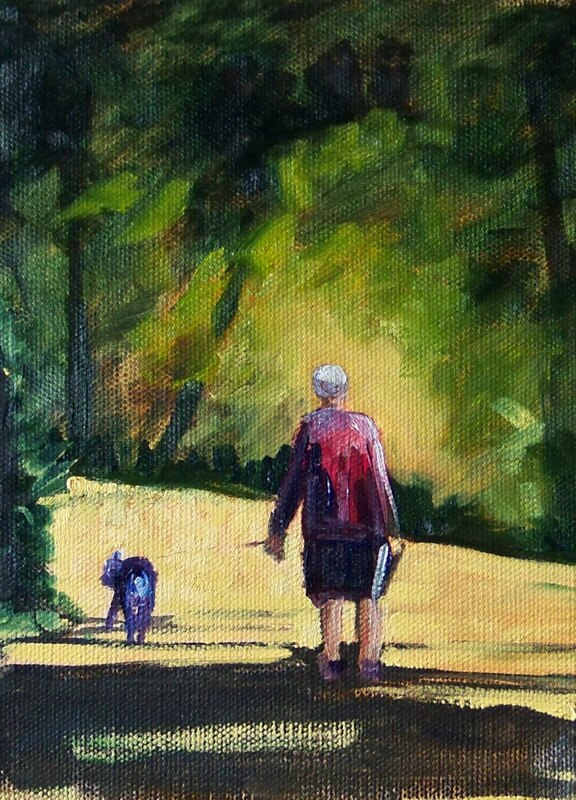 A boy and his dog on the beach, a man running with his dogs, and another boy with a dog are just a few of the other dog walker paintings I've done in the past few months. Recently I bought a case of 6x8 inch stretched canvases. Painting on canvas is my favorite surface. The way the brush drags and the way the paint spreads feels good; I've been painting on these little canvases for the past couple of days and thoroughly enjoying it. 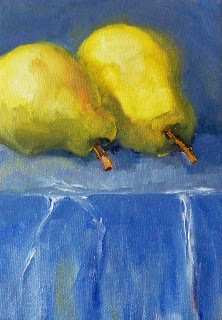 This morning I went to my favorite fruit stand, bought three of these little green pears, came home and began painting. When the paint is dry, these little studies will be for sale at my Etsy Gallery, Small Impressions. Click here to view some of my other small fruit paintings. Recently I was lucky to be the recipient of a collection of red Gerbera Daisies left over after a family wedding. At first my thought was to plant them in my garden, then I arranged them on my patio, then I decided to paint them. This is one of a series of three 6x8 inch paintings that resulted from my fortunate inheritance. I love the red color and the delightful memories that these little daisies have brought to my household. It can be purchased online from Small Impressions Gallery for $75.00 plus shipping by visiting the gallery here. Becoming a better painter of the human figure is a skill I contemplate from time to time. To be especially good at painting the figure takes years of consistent practice. I don't practice as often as I should, but every once in a while my brush and I put forth an attempt. A woman reclining on the lawn in the midst of a city park inspired me to try once again. She was clothed from head to toe, so I concentrated on proportion and the way the cloth draped across her body. 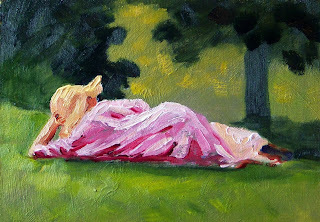 I tried to capture the leisure attitude of summer as the figure emerged. 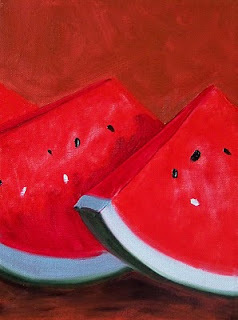 It was a fun little painting that reminds me why I like the summer months so well. Even though school begins in just a few weeks and I know the end of summer is coming, I can't help painting reminders of the season. 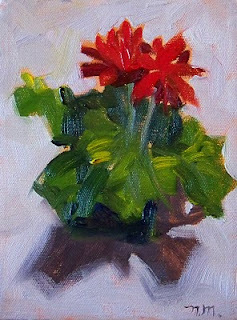 This painting is 8x10 inches on a gessoed hardboard panel. 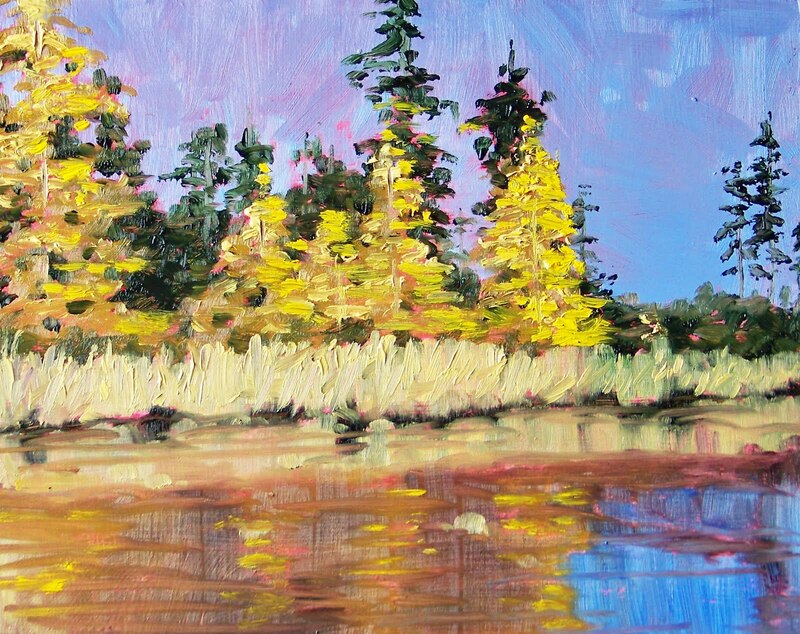 Working on reflections and the feel of water on a 2-dimentional surface is always a challenge. I enjoyed it. As we pass the middle of August and head into fall, a good-bye to summer adventure occurs. 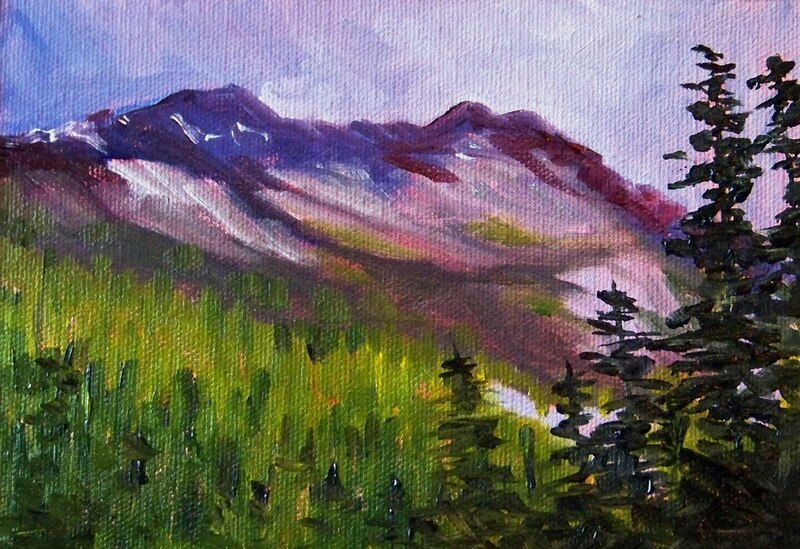 This little 5x7 painting is a glance at the Cascade Mountain Range in Washington State before the season turns to chill. 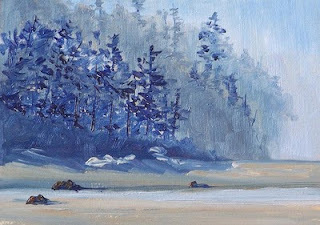 It will join some of my other landscape oil paintings in my Etsy Gallery as soon as the paint is dry. Throughout the summer bicycle riding becomes a part of my routine. Riding through the countryside and exploring the environment on the seat of a bike is one of my passions. On these little adventures, snapping photos is part the trip. This heard of cows is typical of many that I encounter on my rides past farmlands and fields. 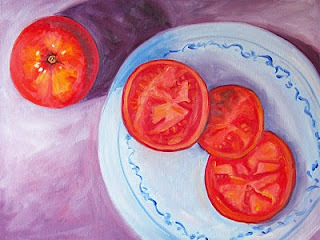 The painting is 8x8 inches on a gessoed hardboard panel. 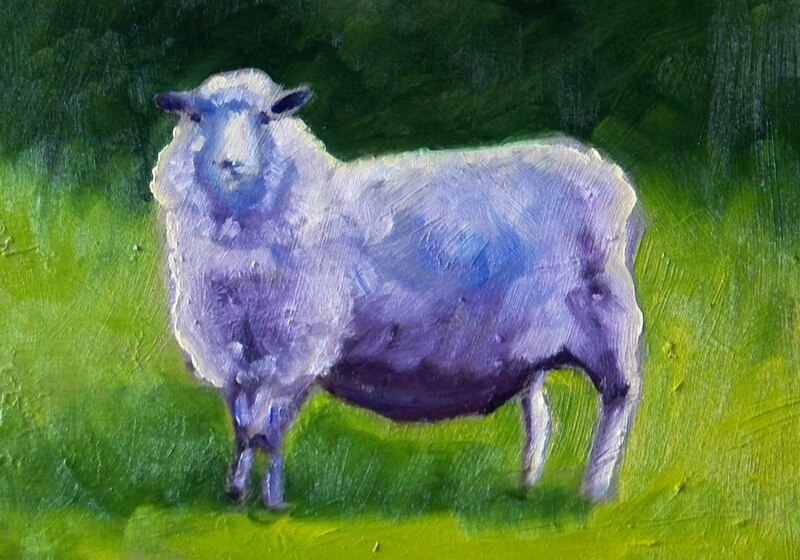 Eventually it will join some of my other animal paintings at the Small Impressions Gallery. Do you like to do home canning? The season is almost here. It is time to locate those mason jars kept in the garage and line your tools up in the kitchen. The cherry tomatoes in my garden always get me inspired. This painting is now for sale in my Etsy Gallery, Small Impressions Paintings. Click here to view it in my shop. It has been a wonderful summer with a family wedding and many joyous days of adventure, but I never expected the surprise to which I awoke yesterday morning. 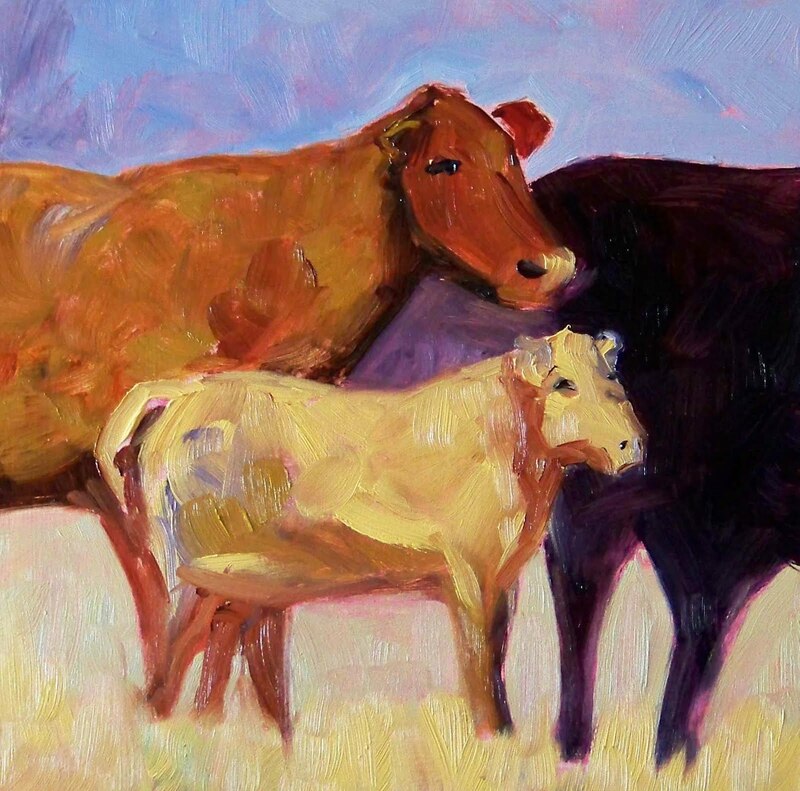 The painting shown above was featured in The Storque, a blog about all things handmade. 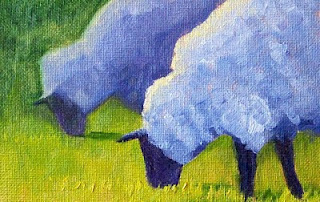 The article about Peaceful Decor created a mountain of traffic for my gallery of Small Impressions Paintings and a lot of excitement. 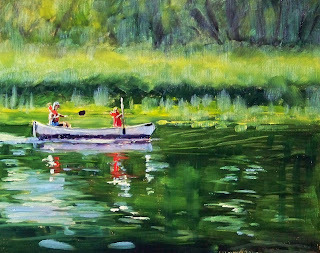 The painting was created in oil on a1/4-inch hardboard panel. It is 5x7 inches and will fit in most standard sized frames. I have also displayed these little paintings unframed on a miniature easel. The purchase price is $50.00 plus $6.50 for shipping to US addresses. The painting is sold unframed and does not include an easel. Visit here to purchase. 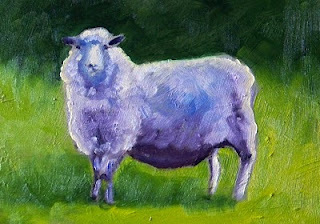 Painting the big sheep yesterday was so much fun, I painted another sheep painting today. This one is just 4x6 inches. The abstract shapes and colors are what has been most enticing for my paint brush. In a few weeks when the paintings are dry, they will be listed for sale in my shop of original paintings at Etsy. Click here to view the shop and some of my other small paintings. It was a joy to paint today. This big blue guy seemed to just paint himself. 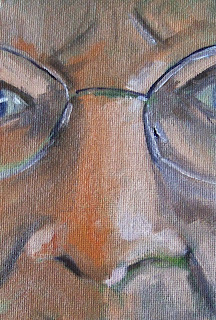 He was created on a 5x7 inch hardboard panel with my usual medium, oil paint. My palette was ultramarine blue, alizarin crimson, cadmium yellow, sap green, and titanium white. He is for sale at my Etsy Shop. Click here to view some closeups. Usually my paintings are small, but today I felt a need to expand to something larger. This painting was completed on a 18x24 stretched canvas. It felt good to create an oversized painting. It was so much fun, I may paint a couple more of this size and replace the paintings currently hanging in my kitchen. I'm not ready to give up on summer yet though I've been painting some images of fall and winter. 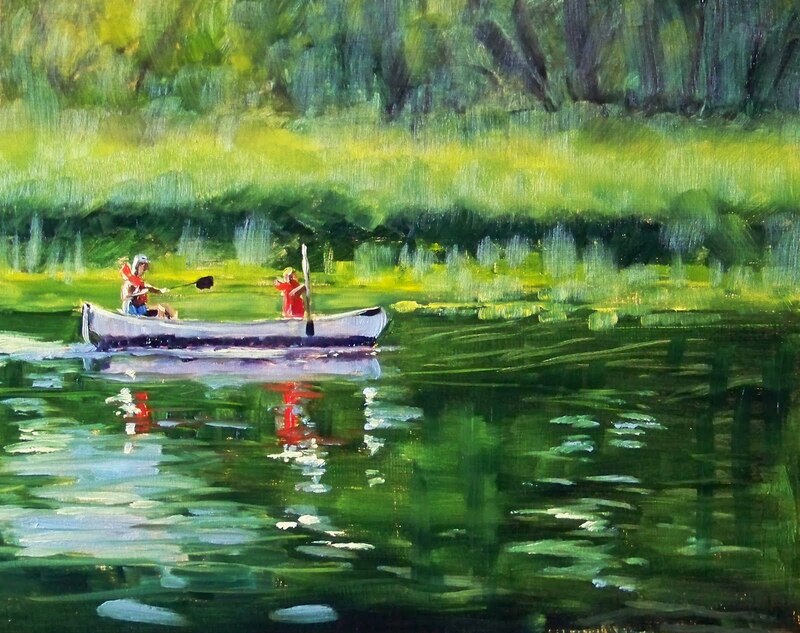 Creating this 9x12 inch oil painting reminded me there is still some summer fun left. 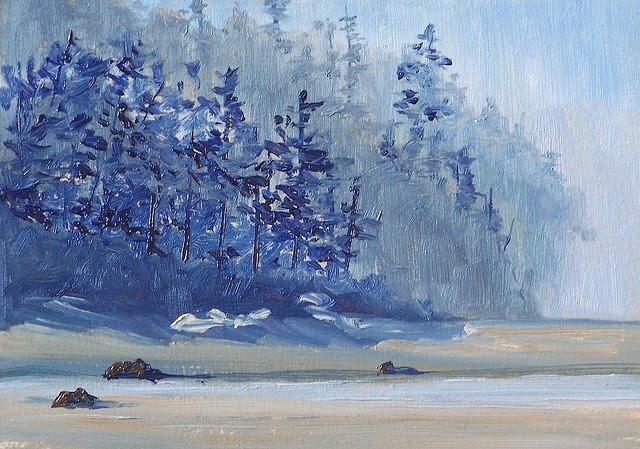 It is for sale at the online gallery, Small Impressions Paintings, and can be a reminder of the season for a new owner. View it in the gallery. With the advent of August, it is time I begin recognizing that fall is just around the corner. The flowers on my deck are beginning to fade, so I began to contemplate the colors of autumn that are coming soon. The thought of the changing season prompted this 8x10 inch oil painting.